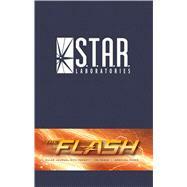 Celebrate the hit television show The Flash with this deluxe writing journal, emblazoned with the S.T.A.R. Labs logo. A premier research and development facility, S.T.A.R. Labs built a next-generation particle accelerator, which they claimed would provide energy to all of Central City. However, the accelerator exploded shortly after it was activated, releasing a dark matter energy wave. When forensic scientist Barry Allen was hit by lightning, the power of the energy wave imbued him with super abilities and led him to become the speedster known as The Flash, using his powers to fight crime and save Central City. Now largely defunct, S.T.A.R. Labs operates as the headquarters for Team Flash.